have directly elected police authorities. surrounding the Damian Green affair." "insensitive to the rights and freedoms of minorities in that area". the Government dropping its plans. the focus for public accountability. recently in their book: The Plan. saying "We do not trust to you vote for the right people"? 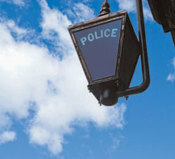 50 comments for: Time to make the police democratically accountable?